The memoirs of rankers are rare and it is surprising to find that this is the only memoir of the 2nd Lifeguards apart from Waterloo correspondence published by Siborne and myself. Thomas Playford was born in Yorkshire in 1795 and was entered on the books of the 2nd Lifeguards in 1810 at the tender age of 15, although recorded as 18 years of age, being nearly 6 foot 2 inches in height! Thomas was perhaps a slightly strange figure for a soldier of this period; being well educated, happy in his own company, having a strong religious conviction and with an aversion to strong drink and the company of loose women! There is some irony in his omitting from his memoirs a moral lapse that in fact led to his joining the Lifeguards, an event that may have hardened his moral resolve. Despite being out of step with soldiering, he was observant and analytical, causing his views of military campaigns and life in the army to be astute and well informed. 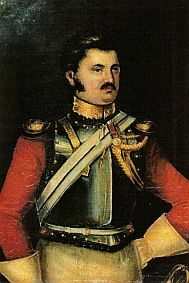 Thomas accompanied the 2nd Lifeguards to Portugal in late 1812 and marched across Spain to participate at the Battle of Vitoria in 1813 and the campaigns in Southern France in 1814.
interest. 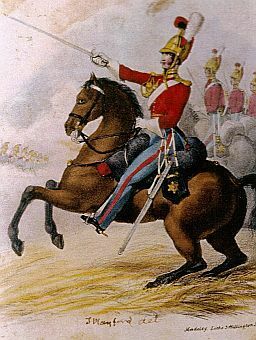 The 2nd Life Guards lost 156 casualties at Waterloo from an initial effective strength of 231, a 68% casualty rate! and witnessing numberless men succumb, that he never actually crossed swords with anybody that day!! Playford also wrote his own memories of Lifeguardsman Shaw during those fateful days and these prove of particular interest. Shaw, a huge man and famous pugilist, who died a hero, spawned numerous stories of his legendary martial prowess at Waterloo. Thomas was clearly aware of Shaw’s fame and hints that the tales may have been exaggerated somewhat by the press of his day. Some things never change! Following the battle, Thomas’s other abilities were recognised and he was often utilised to aid the regimental staff deal with the mountain of paperwork. This eventually led to his being utilised to delve into the regimental records and to produce the first official history of the regiment for King George IV, not perhaps something usual even for an educated ranker. Later, Thomas used his experience to help Cannon compile his famous series of regimental histories. unfortunately the original manuscript was lost many years ago in a bush fire. I have been forced, however, against my usual principles of publishing all; to remove vast swathes where Thomas digresses to explain in tedious detail his religious views or to castigate those of other religions, and a very long passage describing his religious conversion including visions and voices which would prove extremely tedious to the general reader. Many years later Thomas’ eldest son, another Thomas Playford, wrote a memoir which included a number of interesting facts regarding his father which fill in some of the gaps left by his father’s memoir, almost certainly because his father would have preferred to have left them hidden! These I have incorporated into the text in the relevant sections. 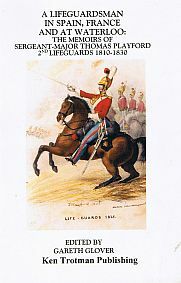 I have also tied the text together using the narrative of the `Historical Record of The Life Guards’ which we know was written by Thomas in 1836. Therefore the text you read in this book is an amalgam of all four sources, gaining by the information gleaned from each and losing nothing of importance, as only repetition has been omitted.